Optional swaddle and carrier attachment straps for easy loading, adjustable support as baby grows. 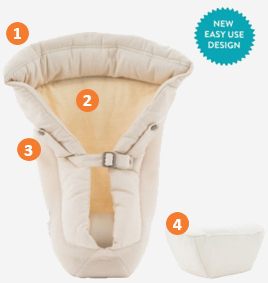 Infant Insert supports baby in those early months, allowing carrier to be used from early on until toddler stage. Can I use my Infant Insert without the pillow? Yes, if your baby is larger or taller and does not fit within the Infant Insert with the pillow but still requires head and neck support, you can just use the outer shell of the Infant Insert to ensure baby is properly supported. Do I need to use the side straps to attach the insert to the carrier? The newly added side straps on our Infant Insert are optional and are designed to securely attach to carrier to prevent the Infant Insert from falling out of the carrier as you remove your baby from the Carrier or Infant Insert. How do I use the infant insert and how do I check for proper positioning? Whenever using the infant insert, please make sure to read the usage instructions carefully and refer to the Youku videos for added help, especially for babies 0 to 4 months. To maximize air circulation for your baby in the infant insert & carrier, you should always make sure that the baby’s face and head remain uncovered and that the baby’s face is visible and with the top of her head close enough to kiss at all times. Also, for correct positioning, check to ensure that you can fit a finger between your baby’s chin and chest at all times. How will I know if my baby is ready to use the removable pillow alone in the carrier? The pillow is for babies who are either too short to bend at the knees when seated in the Carrier or would like to be seated higher in the Carrier. I have the older version of the Infant Insert; where can I view the instructional videos for this version? If my baby is over the maximum weight limit recommended for use but does not have consistent neck control, do I still need to use the Infant Insert? The references to ages and weights are only general guidelines and each baby’s development is different. 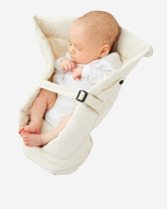 The Infant Insert should be used until your baby displays strong head and neck control and can be seated comfortably in an ergonomic, frog leg position within the Carrier. What is the difference between the design of the new Infant Insert and the previous version? The redesigned Ergobaby Infant Insert addresses key consumer concerns around usability, breathability and security. Designed so you can safely carry your baby early on, the redesigned Ergobaby Infant Insert is more intuitive and easier to use. Which carry position can the Infant Insert be used in? 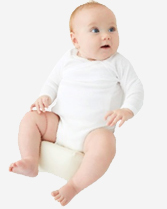 The Infant Insert and pillow are only intended to be used in the front inward carry position. Which carry position can the pillow be used in? Which Infant Insert is compatible with which carrier? Which way should the triangle point on the pillow? The stitched triangle emblem on the pillow should be pointing upward, with the baby seated on the wider seat of the pillow. When used with the shell of the Infant Insert, the direction of the triangle is easy to match with the stitched triangle on the shell.